During the game players take turns to perform actions using their available units and bases. Once a unit has completed all of its available actions it cannot be used until the next turn. At the start of your turn you gain credits for each captured base. Use your credits to build more units or save credits to build stronger units in later turns. Once you end your turn you must wait for the other players to take their turn before it is your turn again. If the available unit selected can perform more than one action, this menu will appear. The basic actions most units have are Move, Attack, Stay and Repair. Select the action for the unit to perform. If the unit has only one action available, such as Move, that action is selected automatically without the Action Menu appearing. To move an available unit, highlight and select it. The unit can move to any unoccupied terrain surrounding the unit. The distance the unit can move depends on its range of movement and the terrain. Terrain that cannot be reached or occupied will be shaded. After selecting the new location, select Stay to confirm the move or Cancel to return the unit back to its original location. To attack an enemy unit in range, highlight your unit and select it. Select Attack in the Action Menu. If only one enemy unit is within range, your unit will engage the enemy automatically. If two or more enemy units can be attacked highlight and select the enemy you wish to engage. 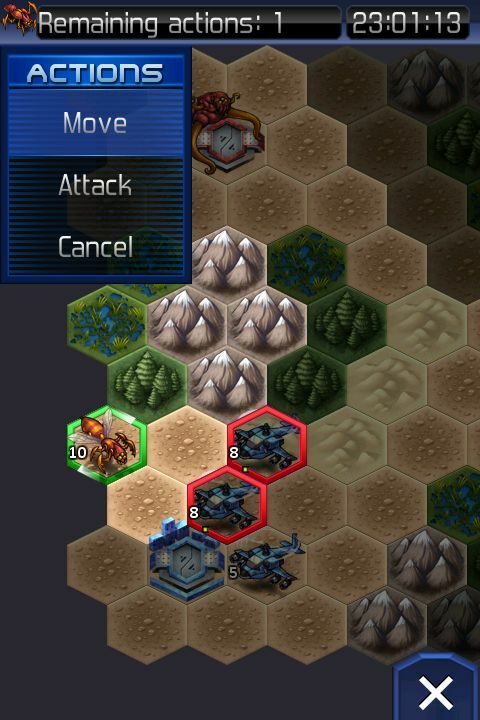 Every unit has a range of attack and some units can attack after a move. Units out of range cannot be attacked. If your unit has a long range, attack a unit that cannot attack you. Your unit will take no damage. To capture a neutral or enemy base that is not occupied, select your unit and move it onto the base. Select Capture in the Action Menu. Capturing a base takes 1 round to complete. Bases can only be captured by certain units. Available units can repair during a turn. To do this, select the unit and select Repair in the Action Menu. Some units can repair more points than others. If units that are damaged are still available at the end of the turn, they will automatically repair themselves.